We do reformer pilates to awesome music, join us by visiting our SIGN UP page . Fun Friday offer: Classes only £14.50 and valid peak as well as off-peak time slots on a Friday. We do reformer pilates to awesome music, join us by visiting our SIGN UP page. Introduction offer: first class only £15. Welcome to the Pilates blog. It’s sad to say, but summer is over. It’s getting dark earlier and more difficult to get out of bed in the mornings. Motivation and energy levels are on the wane. But this is where exercise comes in. Nothing raises your energy faster and more effectively than exercise. The simple act of moving can jump-start your metabolic machinery. Recent research shows that exercise has a direct, immediate effect on energy – if you do nothing more than stand up and hop up and down for three minutes, you will feel a surge of energy, and most likely a boost in your mood. How does exercise boost energy levels? An increase in endorphin levels. Endorphins are natural hormones in the body that get released when we are doing something that requires a burst of energy. They give us the energy to keep moving. Better heart health. Exercise boosts cardiovascular health, which allows you to have greater endurance throughout the day. When it’s easier to do your daily activities, you’ll have energy left and not feel so tired at the end of the day. Improved sleep. Exercise allows you to get a better night’s rest; when you get quality sleep, you feel perkier during the day. 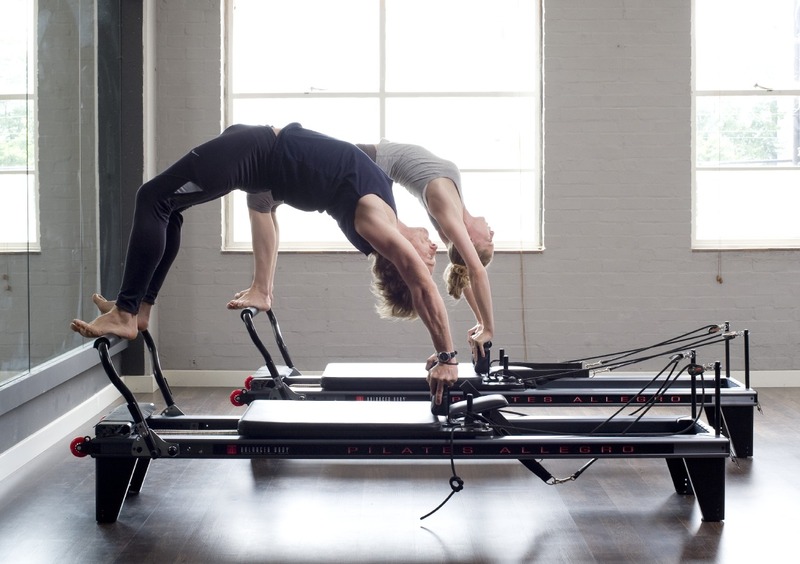 Reformer Pilates is a great way to re-energise. The physical conditioning, as well as the emphasis on breath control leaves you feeling worked out, relaxed and invigorated. Going back to breath control, those of you who do Pilates will know that it’s key to the Pilates method. Each exercise has a different breathing pattern, designed to get the most out of your muscles, while increasing oxygen to your brain – giving you more energy. • Stay hydrated, lack of fluids is a major cause of fatigue, since they transport nutrients and oxygen to our cells and organs. • Make stress work for you, stress has a bad rap but a certain amount of positive stress is good for us. Add some challenge to your life, whether it’s taking a writing or painting class, learning a new hobby or asking for more responsibility at work. • Don’t skip breakfast, the word breakfast literally means “to break a fast,” and your body can’t shift into full gear when it hasn’t had fuel. • Keep your iron in check, sluggishness especially in women, may be a sign of low iron. Women aged 19 to 49 need 18 to 30 milligrams a day of this mineral (eight milligrams after age 50), which helps the blood absorb energy-producing oxygen. • Cut out caffeine, caffeine stimulates adrenalin release and blocks a relaxing brain chemical called adenosine. The net result is that it jazzes up your body and produces a stress reaction; once the initial jolt wears off you’re left feeling even more tired than before. The Long Spine exercise is a great one for energising. It is an inverted pose – meaning your head is below your heart. This gets more blood flowing to the brain, which results in physical and mental revitalisation. The exercise is also great for strengthening and stretching the spine, working the core and toning the legs. You can also do this on the floor. Lie down on the reformer with your feet on the footbar. Here’s the part of the blog where we answer your burning questions about Pilates. So if you’re wondering which Reformer exercise will best target your gluteus, or why your abs shake while you’re holding your plank, post them below, Tweet us, or send us a message on Facebook. Q: Should I do Reformer Pilates when I have aches and pains? A: Muscle soreness that occurs 24 to 48 hours after exercise is normal, especially if you’re not used to exercising or have pushed yourself hard. It would be a good idea not to strain the sore muscles further with strenuous exercise but you can definitely continue with moderate exercise, and it will probably make you feel better. Joint pain: This is different to muscle soreness and should not be dismissed or ignored. Exercise should not result in pain in the joints. Shooting pains: If you have shooting pains anywhere, it might indicate a neural problem. If they persist, you would probably benefit from seeing an Osteopath or a Physiotherapist. Persistent pain or swelling: If a pain persists for longer than two weeks or gets worse, see a healthcare professional, especially if the pain doesn’t respond to standard treatment methods (e.g., rest, ice, over-the-counter pain medications). Persistent swelling in or around the area of pain is also a warning sign. Don’t forget that pain is the body’s way of communicating to us that a problem exists and a potential injury may be on the horizon. Q: How is Reformer Pilates different than weight training or other resistance exercise? A. Firstly, let me say that strength training is great for building muscle, which is important. Strong muscles protect against bone loss, help increase your metabolism, and aid in preventing osteoporosis, but weight training is not the easiest way to fine tune and fine tone muscles. This is where Pilates comes in. It’s perfect for toning those smaller muscles that are hard to target with weight machines. By using your upper and lower body strength to move your body, every muscle is targeted in multiple ways. Q: Can men do Reformer Pilates? A: Absolutely! Because it does a good job strengthening the lower abdominal and pelvic muscles that are important for a woman’s childbearing, reproductive and urinary function, and because it doesn’t involve heavy steel, grunting or large amounts of weight, Pilates is often perceived as a “women’s only” activity. But nothing could be further from the truth. Firstly, Pilates was invented by a man (Joseph Pilates). His work was never gender specific and in fact, his influence came hugely from martial arts techniques & the study of animal movement, in particular cats – think shell stretch. Secondly, plenty of male athletes such as Andy Murray and Amir Khan, and the entire England Cricket Team practice Pilates alongside weight training and cardio. How’s this for a spectacle? On September 10, more than 1,000 people took part in a Pilates class at the place where its German creator, Joseph Pilates was interned on the Isle of Man, during World War One.The class was inspired by a postcard depicting internees putting on a Pilates display, just 15 days after Pilates’ arrival at the Knockloe camp. The Knockaloe camp was divided into 23 compounds each designed to hold 1,020 internees.Organisers recreated that figure for the one-off 45-minute class. As an incentive to try one of our Tempo Pilates classes, we’re running an introductory offer for anyone new to Tempo Pilates. Instead of £26, if you visit our sign-up page and create an online account here, your first class will cost £13. So why not experience the many benefits of Tempo Pilates? We have three studios – in Hackney, Shoreditch and Covent Garden – each offering a range of affordable Pilate’s classes to suit every level of fitness. Pilates near me? Check out our studio locations below and see if you can book your reformer pilates class with us today. Welcome to the autumn edition of the Tempo Pilates blog. Can you believe it’s September already?! The summer holidays are over and we’re reluctantly getting back to into our normal routines – including exercise. While it may be hard motivating yourself back into the Pilates studio, I hope to inspire you with this month’s blog, which is all about strength building, and specifically, how a sports massage can complement your Pilates practice and make you even stronger. This blog post was inspired by one of my Pilates students, who started complaining of painful hip flexors when performing certain exercises on the Reformer. Despite lots of hip flexor stretches, the pain got worse and started impeding her practice. I suggested she tried a Sports Massage, and she promptly booked one with West London based Tamara Knight, who had been highly recommended by other Pilates students. After one session, which included a detailed consultation, muscle testing and a deep tissue massage, she was amazed by the results. She came out with looser hips, a diagnosis of Lordosis, (an exaggerated lumbar curve in the spine) which was the cause of her hip flexor pain and tightness, a detailed report explaining the condition and a list of stretches to help strengthen them and get the most out of her Reformer classes. I caught up with Tamara, an avid Pilates student herself, to ask her about the benefits of Sports Massage, and how it can help Pilates students improve their own practice. Q: What is a sports massage and how does it help? A: Sports massage can help anyone with a soft tissue injury, either from a sporting activity or an overuse injury (which is not always sports related). The aim of sports massage is to restore muscle balance, health and strength in the body, so it’s very much in line with the aims and goals of Pilates. A: Sports Massage therapists use various techniques to release trigger points in the muscles, allowing them to relax. I use various manual deep-tissue techniques, such as Muscle Energy and Soft Tissue techniques (both of which stretch and strengthen muscles) and Jonas Strain Counter Strain, which is a passive positional release. This technique relaxes and dissipates muscle strain, restoring joint mobility. Every technique is designed to stretch the muscle fibres in all directions on a micro level, to release tension and pressure buildup, while increasing permeability. This allows for the efficient removal of waste products such as lactic acid, which enables the muscles to take up oxygen and nutrients, which speeds up recovery time, post-exercise. Q: How can sports massage improve Pilates practice? A: By restoring a greater range of movement to the affected muscles, the client can move more freely during their practice, allowing them to build greater strength without being held back by injuries. Q: Can you tell me about the muscle testing service you offer and how it can beneﬁt Pilates students? A: As part of my training, I was taught how to ‘test’ the muscles and other structures involved in the movement of the body. Offered as part of the initial consultation, muscle testing enables me to pinpoint which structures, joint, muscle, tendons or ligaments are involved in the restriction, pain or injury. It involves me testing muscle groups through active, passive and loaded movements. The results highlight which parts of the body are responsible for pain and need working on. If the problem is muscular, I can work on the muscles indicated in the tests. If it’s not muscular, I can refer you to the right medical professional for a diagnosis and further help. Q: I suffer from motion sickness on the Reformer. How can I prevent this? People often work out in the morning before breakfast, but that means the body has had no fuel since dinner the night before, causing your blood sugar levels to plummet. This will make you feel nauseous and weak. You’re better off having a light breakfast – preferably some protein and/or complex carbohydrates to get you through your class. Orthostatic hypotension is the technical name for that dizzy feeling you get when you stand up too fast. The sudden drop in blood pressure can be caused many medications. It can also be caused by blood pressure that is too low or another health problem. If you experience dizziness often when exercising, you should see your doctor. If there’s a particular exercise that gives you that feeling, perform the movement more slowly, or leave it out of your routine altogether. Another cause of a motion sickness is letting your gaze drift as you are moving. In Pilates, the head should be held in line with the spine and the gaze level from there. If your eyes are wandering or off centre while you are moving, it can make you feel dizzy. If you are on a Reformer, it can be helpful to pick one spot to look at rather than letting the eyes be unfocused with the world passing by. Q: Will Tempo Pilates help me lose weight? A: A lot of people starting exercise are looking for one thing that will give them all-round strengthening as well as help them lose weight. There are very few activities that will do it all, so it’s important to have a balance of different types of exercise to benefit your overall health. Weight loss occurs when the body uses more calories than it takes in. To tap into the energy stored as fat, you need to a) increasing your Basal Metabolic Rate and b) be doing a cardio activity that gets your heart rate up and sustains it at that level for around 20 minutes or more. One of the most basic principles that many people overlook when trying to lose weight is simple: boosting your metabolic rate. Your “normal” metabolism is better known as your Basal Metabolic Rate and it is the baseline of how your body metabolizes the food that you eat in order for it to be expended as energy. This is also the natural rate at which your body burns calories throughout the day regardless of your activities. By increasing your Basal Metabolic Rate (BMR for short) you will ultimately hold the key to weight loss success and the maintenance of that weight for as long as you like. The most effective way to boost your BMR is intense exercise routines perform during Tempo Pilates classes due to the resistance work provided by the reformer and help your body to start burning more calories while you are at rest and even while sleeping at night. As an incentive to try one of our Tempo Pilates classes, we’re running an introductory offer for anyone new to Tempo Pilates. Instead of £26, if you visit our sign-up page and create an online account here, your first class will cost £13. So why not experience the many benefits of Tempo Pilates? We have three London based studios – in Hackney, Shoreditch and Covent Garden – each offering a range of affordable Pilates classes to suit every level of fitness. Pilates near me? Check out our locations below and see if you can book your reformer pilates class with us today.